Objects are pre-defined – video sources; video effects; mixers; etc – and placed on the Surface. Using them looks like a doddle. At the most simple level, simply dragging a video source, close to the video output window, make a connection between them automatically and the video is show. Two mix between two sources, a video mixer icon is simply dragged between two video source and connect to the output window. To favour one video source over the other (make it more dominant on the output), simply move the mixer close to the source. Video effects can be applied simply by placing the icon of the effect in between the video source and output window. These can also be chained together. It’s a great example of someone understanding, not only the device, but simplicity of interface and the task that is trying to be solved. 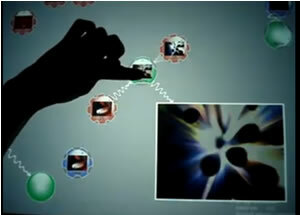 VPlay: An Interactive Surface for VJing from Stuart Taylor on Vimeo. Is it possible to connect a video projector to the Microsoft Surface? So that what you see on the Surface is projected on a screen?